Step into Rift. Whether you?re stepping into your favorite game, watching an immersive VR movie, jumping to a destination on the other side of the world, or just spending time with friends in VR, you?ll feel like you?re really there. 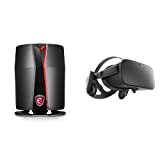 3 Items Oculus Rift Bundle: Oculus Rift Virtual-Reality Headset Alienware X51-Series Desktop Package 16GB 256GB Mytrix Premium High Quality Tough-Braided Extra-Strong CB-HDMIMA29 HDMI Oculus Rift's advanced display technology combined with its precise, low-latency constellation tracking system enables the sensation of presence Customizable, comfortable, adaptable and beautiful, Rift is technology and design as remarkable as the experiences it enables Every aspect of Rift was designed to be easy, inviting and comfortable to use ? and that extends to the VR environment Oculus has created as a starting point for your journeys Discover and download games across genres ranging from action RPGs, sci-fi shooters, mind-bending puzzle games, and more ? 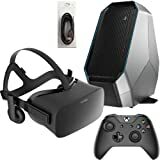 and play them from an entirely new perspective Oculus Rift includes the headset, the sensor to translate your movements into VR, the Oculus remote, an Xbox One controller, cables and the VR-compatible game Lucky's Tale; Internet access required Oculus-ready desktop features a 6th Gen Intel® Core? 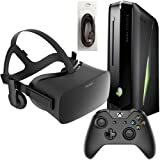 i5-6400 processor, 16GB memory, 256GB SSD, NVIDIA GeForce GTX 970 graphics with 4GB GDDR5 dedicated memory, HDMI 1.4 output, Windows 10, and 2 USB 3.1, 4 USB 3.0 and 2 USB 2.0 ports Desktop also features a double-layer DVD±RW/CD-RW drive, next-gen wireless networking (802.11ac), Bluetooth and 7.1-channel audio support with Waves MaxxAudio Total package savings may include instant savings on individual items. This package price will no longer be valid if you return one of the items.